The plan, a reasonable loop. I expected this to take one night, but I told my wife it might take two, so don't worry until Saturday evening.� I arrived at the Bridge Creek campground at noon to find the gate closed and the road dry nearly to 8-mile campground.� There was one other truck in the parking area, and a USFS vehicle was opening the gate.� "Can I follow you in? "� "No, the road is closed. 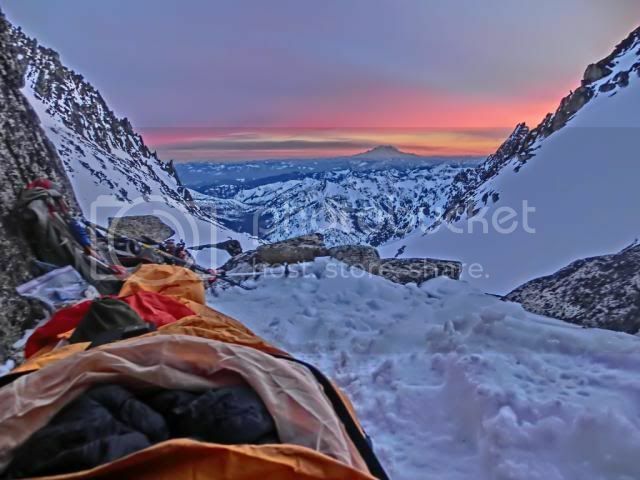 "� Bummer.� This adds 4 miles to the approach.� It's a decent walk in though, with views of Cannon Mountain Couloir from the road, and of Colchuck Col from the trail. 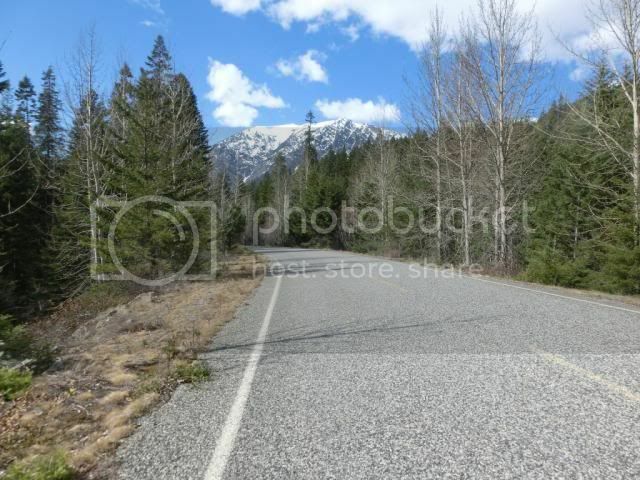 this is taken with a feature called HDR on my camera.� I like the effect. 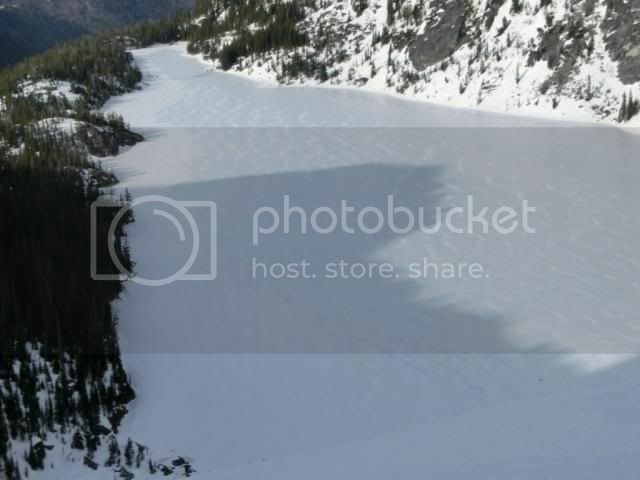 On Friday morning I skied down�the south facing Porcupine Creek to Ingalls Creek.� The snow surface was firm, but there was plenty of evidence of wet loose slides from yesterday. 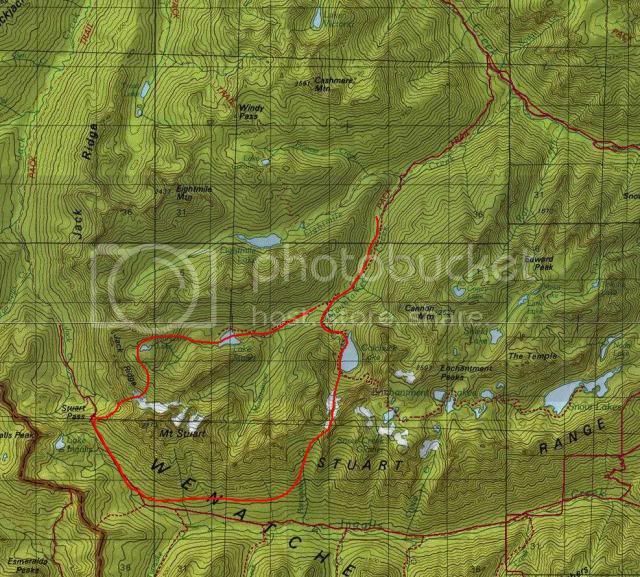 Today was supposed to be warm again and I was immediately aware that there could be some timing issues with my plan.� There would be no afternoon retreat up Porcupine Creek.� I might end up stranded somewhere waiting out the afternoon avalanche cycle. Ug. This was predictable, but not by me.� About 2 miles up Ingalls Creek I saw fresh bear tracks and then the skin fell off my left ski. On foot from here.� Skins on the drying rack. 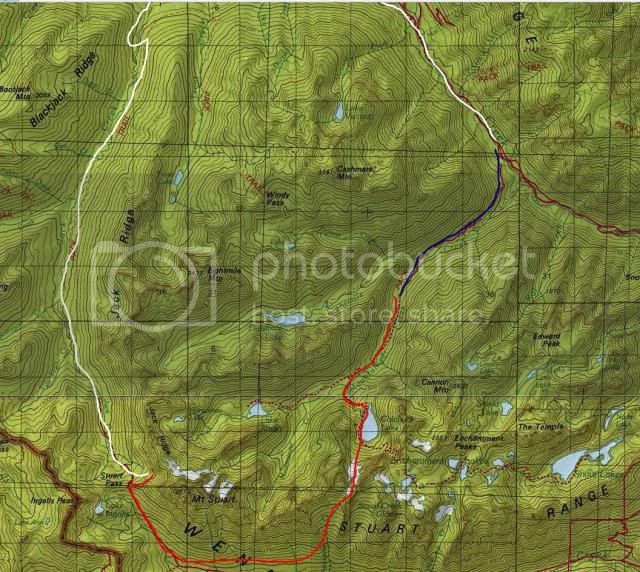 The crux of this loop would be rounding the west to north side of Mt. 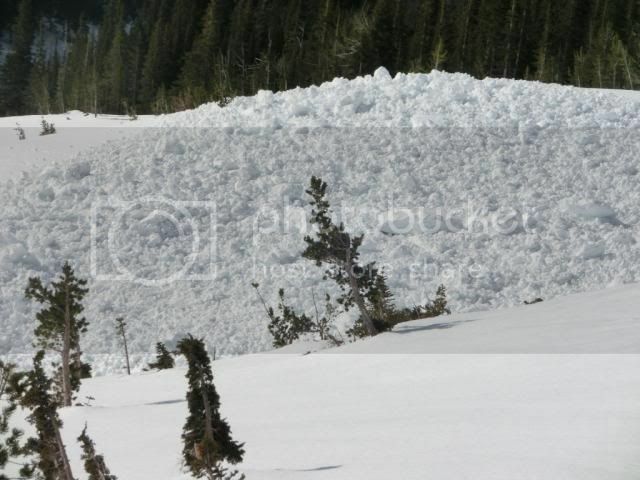 Stuart.� I've done this before in the summer, but never with a full snow pack.� I had two concerns.� 1. 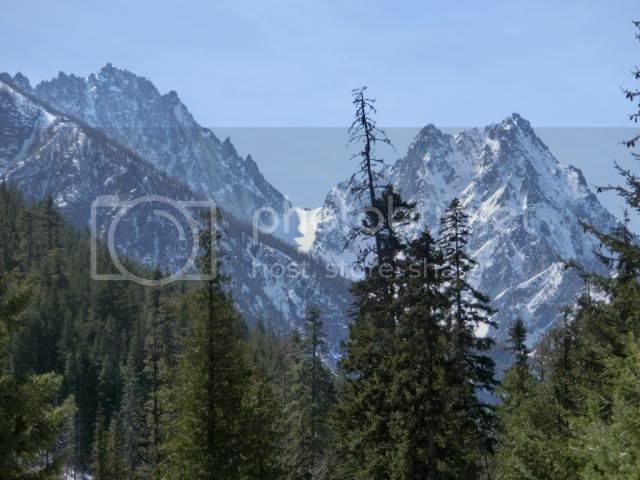 Would there be show-stopping cornices at Stuart Pass or Goat Pass?� 2. 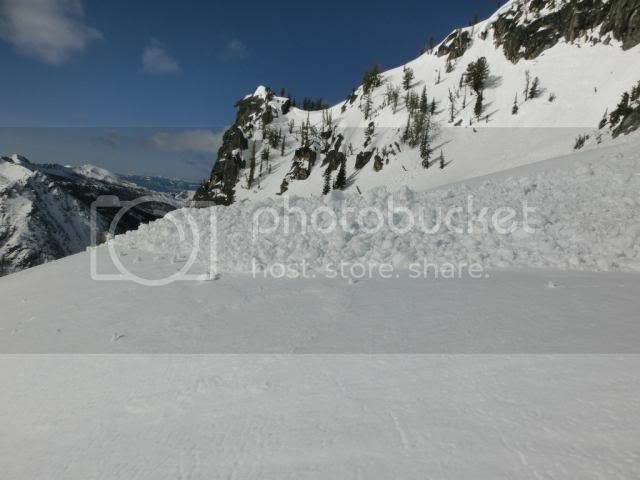 Would the ski to Stuart Lake be obvious? 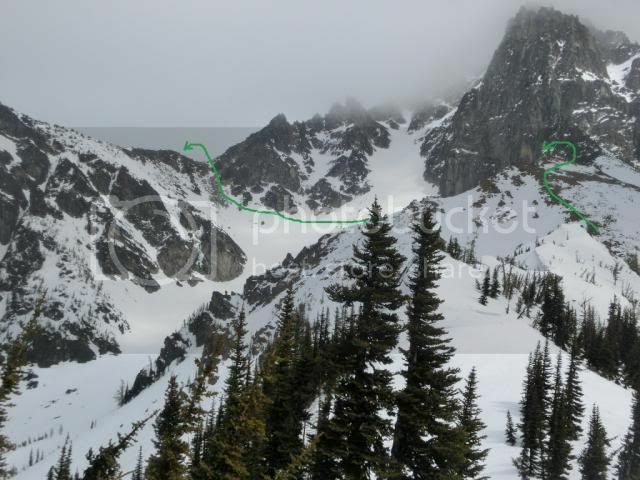 I was okay with a "no" answer to either problem, because if so, I could reverse the route down Ingalls Creek this afternoon, and in the morning when the snow was firm, climb back up Porcupine Creek to Colchuck Glacier and out by Saturday afternoon.� Here is the crux area from near Stuart Pass; The rock on the right is the west ridge of Stuart and the low point on the left horizon is Goat Pass. Stuart Pass to Goat Pass can you see the snowmobile tracks? 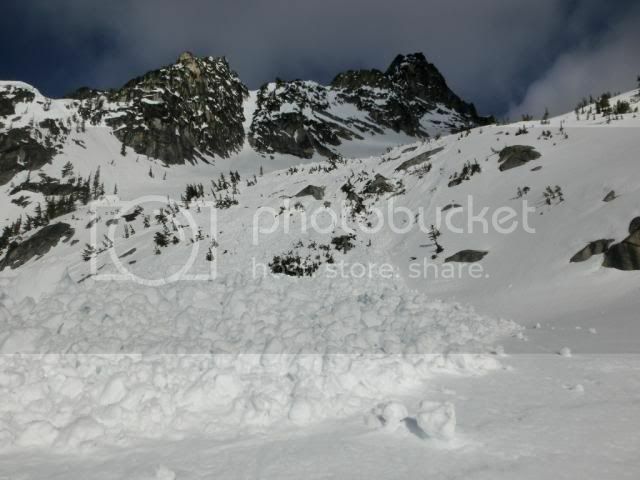 By the time I got to this location it was 2:45PM and the west facing snow slope that I wanted to cross was in full sun.� The post-holing I had recently returned to was thigh deep.� The broken trees and debris piles were still on my mind, and I knew that I did not want to cross that slope this afternoon. 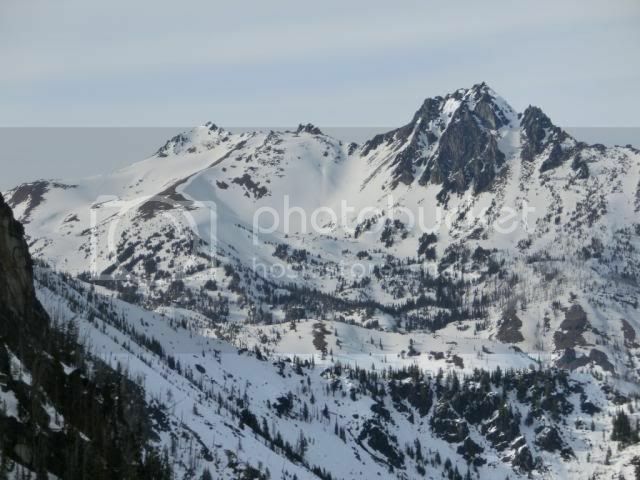 I wanted so badly to wait for morning and then go, but if I did that and then ran into cornices or no good ski path, I was going to be a day late in return.� I think panicking my wife may affect all future ski trips for me, so that risk was not worth taking.� The choices I saw for getting back to my truck by Saturday were; 1. ski down Ingalls, wait for morning, return via Colchuck, or 2. 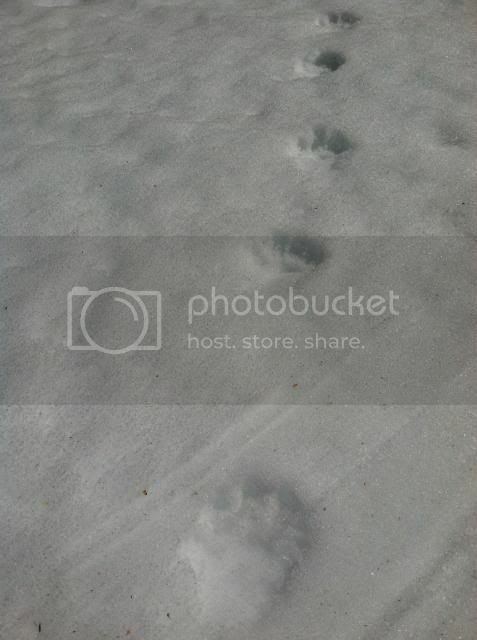 Ski down Jack Creek to Icicle Road.� The earlier bear tracks pushed me to the Jack Creek option. 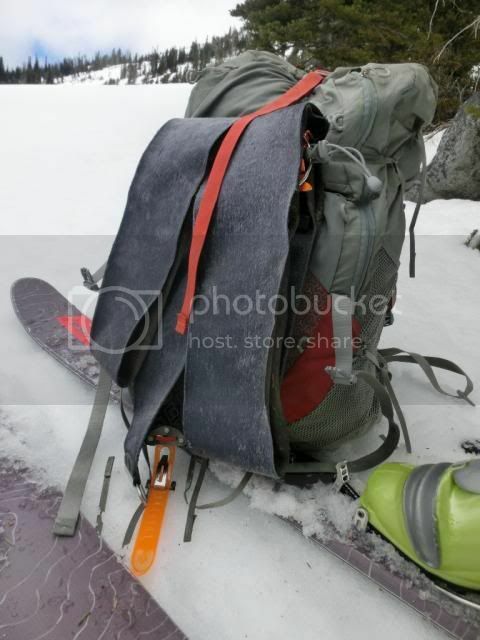 Here's a funny thing;� A guy tromping down the bone dry road in his ski boots, with no nearby snow, and with skis on his pack, shouldn't that raise some curiosity?� "Whats with the boots?" "Where you been skiing?" "You some kind of lunatic? "� It was as if I was invisible. I saw this and several snowmobile highmark tracks on the Jack Creek side of Stuart Pass well within the wilderness boundary. ... looks like a fine trip! I'm proud of you Mike, I know it was hard not to follow your original plan. Adam Vognild and I did a similar trip a few years ago, but went up Sherpa Glacier and around from there. Skiing down the Cascadian probably saved us a bunch of time, especially as we contoured West towards Stuart Pass as we descended. I forgot to add the 4 miles of approach road! So you walked a total of 14 miles dry rd. on this tour. You're crazy obsessed Mike! Looks like a fine outing. If you ever need a partner for a similar type trip in the coming weekends I'd be happy to join you. That's an insane trip - you should have a medal for being so insane. nice. 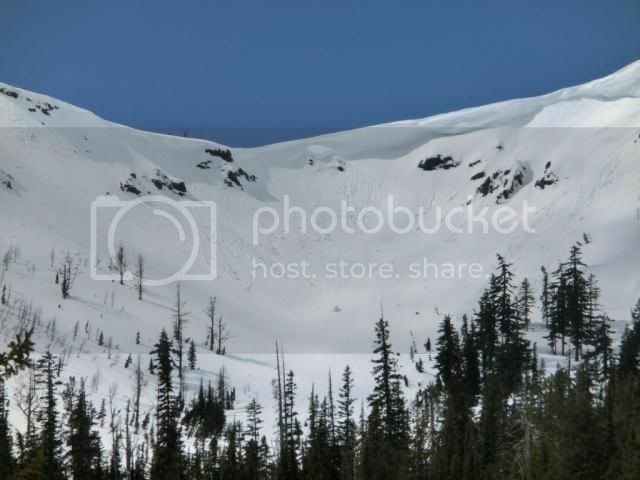 bear tracks and awesome cornices add a great touch to any spring tour. pattern base skis are a fine asset when conditions get sloppy. Side stepping or post holing, I hope you have that out of your system, but I fear you may not! Nice evening picture too, and of course 15 miles of ski boot walking, what could be better than that! Insanely over zealous! Outstanding! I've always wanted to ski Porcupine Creek. Do you have any more pics of that descent? If so, please post em. 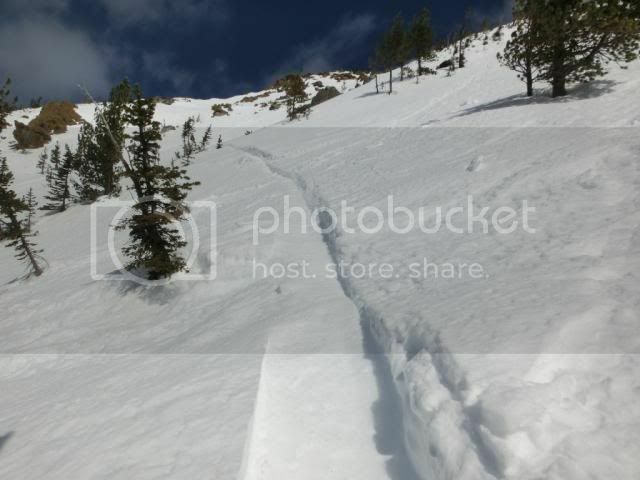 We skied Ulrichs Couloir on Saturday didn't see any snomo tracks anywhere in the wilderness. Very disappointing to hear about your findings up Jack Creek. Few bad apples. . .
BTW - Stuart was literally mobbed this weekend! We encountered a solo sled-access day tripper at the snow line on the road (currently 1 mile in), 2 guys heading out on skis from the end of the road (planning to ski Stu and then ski 10+ miles back to their truck on Sun), 2 guys near the false summit, who skied down from there, and a party of 6+ camped out at Longs Pass (planning to ski Stu on Sun). We also encountered a party of 2 on the summit, who were climbing Stuart Glacier Couloir c-to-c. Stuart is the new Chamonix. 1 mile in from where? 1 mile in from end of pavement. Great trip! Must have been pretty neat to see those bear tracks. One suggestion for the skins issue would be to pack a few Voile straps. They're light, and 2 per ski will keep the skins on for most terrain. I find athletic tape to give the best glide for keeping uncooperative skins on. Also ski straps have saved my skins. One mid ski up front, and one mid ski in back seems to hold 'em on nicely. Mike� I *really* wish I could have joined you. Missed out on a good one. Keep inviting me! Someone once gave me a button that said, "Experience is what you get when you don't get what you want." Your dad was right. It was not a failure because you now have experience with timing you can apply to future trips, and you learned the value of carrying some duct tape (or athletic tape). You should feel really good about making decisions based on the situation at hand, and not getting blinded by your goal, which has certainly killed many an adventurer. You lived, and retained credibility with your wife to try again. BTW: Unless the goal is to be as adventurous as possible, you could always call the ranger district to find out what roads are open.